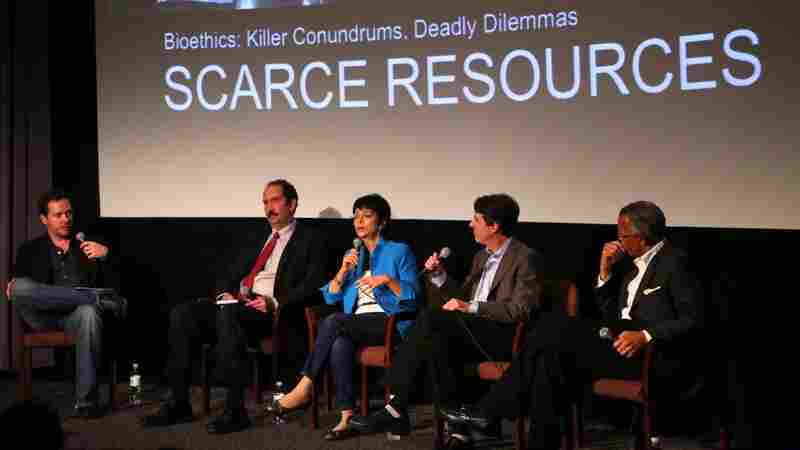 Bioethicists Give Hollywood's Films A Reality Check : Shots - Health News Bioethicists from Johns Hopkins talked shop with members of the film and television industry. Because a good story is an accurate story, the two groups discussed how to better portray moral medical issues on screen. 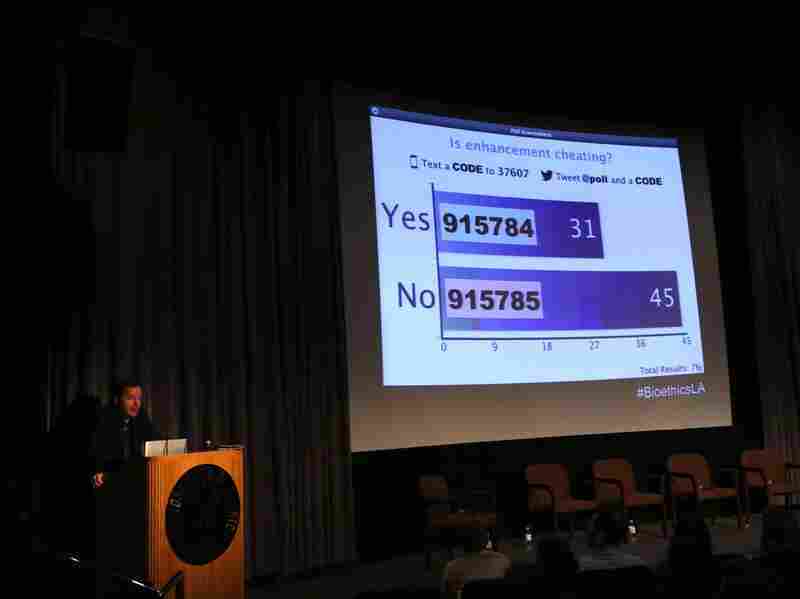 Directors and bioethicists hashed out how moral medical issues should be depicted on screen during a meeting in Los Angeles. A life-threatening pandemic occurs. You're a doctor in the ER and can save a 9-year-old or a 63-year-old doctor. Whom do you choose? How do you choose? Questions like that can crop up in real life and also on the silver screen. So how good a job do filmmakers do at portraying these moral dilemmas? Some do fairly well, but there's also room for improvement. A group of bioethicists from the Johns Hopkins went to Hollywood on Oct. 8 to talk about injecting an extra dose of accuracy in film and television. The Science and Entertainment Exchange, a project of the National Academy of Sciences, hosted the event. To Rick Loverd, head of the exchange, the bioethics panel represents a natural meeting of the minds. "Storytellers really enjoy working at the edge of the bell curve," he tells Shots. "Where it's unclear where the right answer is and there's moral ambiguity. Thinking about bioethics really engages an audience about thinking about the future." Three topics drove the discussion. How to allocate scarce medical resources was one, such as the case of saving a child or an elderly doctor. The broad array of human enhancements was another, with discussions ranging from vaccinations to genetic engineering. During the session, the bioethicists asked: "Is enhancement cheating?" And third, the ethicists and directors talked about how privacy and health data can mix well or clash. Say a business wants to use its employees' health information to create a better work environment, but the workers don't want their details in the boss's hands. Where's the middle ground? Ruth Faden, head of Hopkins' Berman Institute, says there has been behind-the-scenes work between bioethicists and entertainers since 2008. (The Science and Entertainment Exchange holds about 30 events a year.) She says the more accurate our movies, the more sophisticated our dialogue about the issues afterward. There's even a website with examples of faithful depictions of bioethics in the media. "Every time we've had an epidemic-based movie, we've had an opportunity to have a public discussion about the ethics of how we ought to respond — the limits of what is possible and what principles we should be using to allocate the resources we do have," she tells Shots. Jacob Rosenberg, a filmmaker with Bandito Brothers, said the discussion about genetic enhancements applied to a project he's working on now. The conversation confirmed some of the technical details of his storyline. As for movies that depict a serious disease outbreak, the solution might sound simple: Save whom you can and don't look back. But Rosenberg tells Shots the discussion showed him that's not reality. You can't think like an outsider, he says. "You can have so many conversations about what you would do, but in that exact moment, each of us would react in our own personal way."